> PACIFIC THEATER - Battle of Midway - Pearl Harbor - Guadacanal > SHOMO - "The Natural"
Overall print size: 24" x 22"
Image size: 19.5" x 17"
Captain Wm. A. Shomo is seen off the northern coast of the island of Luzon, Phillippine Territory on 11th January, 1945 during an armed recon mission. 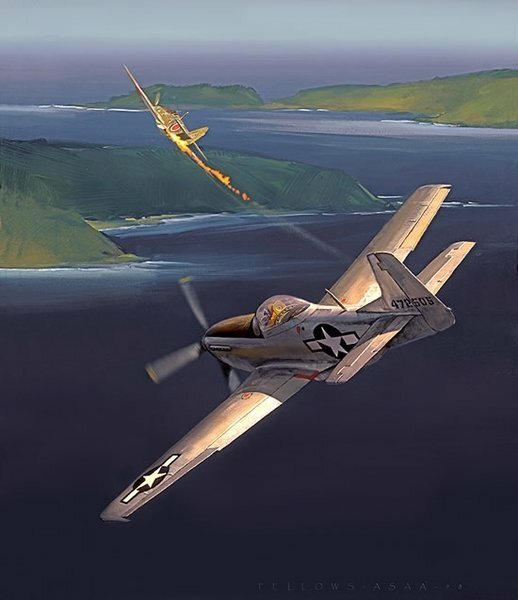 Captain Shomo, CO of the 82nd Tactical Reconnaisance Squadron, and his wingman, Lt. Paul Lipscomb attacked a formation of 12 'Kamikaze' aircraft and one 'Betty' bomber. Shomo shot down seven, including the 'Betty' and Lipscomb shot down four more. Shomo, considered to be a 'natural' fighter pilot was awarded the Medal of Honor for his actions on this mission.